Offering you a complete choice of products which include isolator panel and neutral isolator panel. 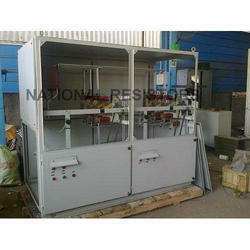 Isolator Panel is specialized in fabricating resistors and panels. Isolation panels, as the name suggests, gives isolated power service as well as protection to critical areas, such as operating rooms in the hospital. It is composed of the transformer, primary and brand circuit breakers, reference ground bus, and isolation monitor distribute power to electric systems installed in operating rooms and isolated power systems. The isolation monitors warn in case of faults and reduce downtime. It triggers the inbuilt alarm. Install isolation panels in your healthcare centers to keep running the systems safely. To buy such panel, you can contact us by calling us or sending an inquiry via email. The professionals will address your inquiry and provide the right solution. Even you can consult with them for finding the right panel to suit your specific application. Keeping in mind the diverse requirements of our customers, we are engaged in offering wide range of Neutral Isolator Panels (NIS Panel) Our product is manufactured in recommended specifications using latest techniques. Customers like our product for their reliability and high grade quality. Moreover, the offered product is tested to ensure their correct delivery to the clients.